Need the precision of a lead-screw? Need short travel against gravity? Our Z-2 positioner with 2" of travel can solve the problem. Constructed with an aluminum frame, precision ground lead-screw, and an anti-backlash nut, the Z-2 is perfect for short X, XY and XYZ applications. The Z-2 is easily attached to our X and XY linear positioner using the SK-4 spacer kit for horizontal mounting or the BR-2 bracket kit for vertical mounting (each listed below). For example: connect the Z-2 to our X-9 to make an XY system with 9 inches of travel in one direction and 2 inches in the other. 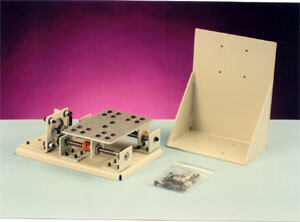 Connect 3 Z-2 positioners together and create a complete 3-axis robotic workcell. The possibilities are almost unlimited! The Z-2 is easily controlled using our MD-2ac motion control system. See a mechanical drawing for the Z-2 positioner.